Assembled PC board shown. The Dual Class-A Output II, "DCAO2," is offered as a bare or fully-assembled PC Board. 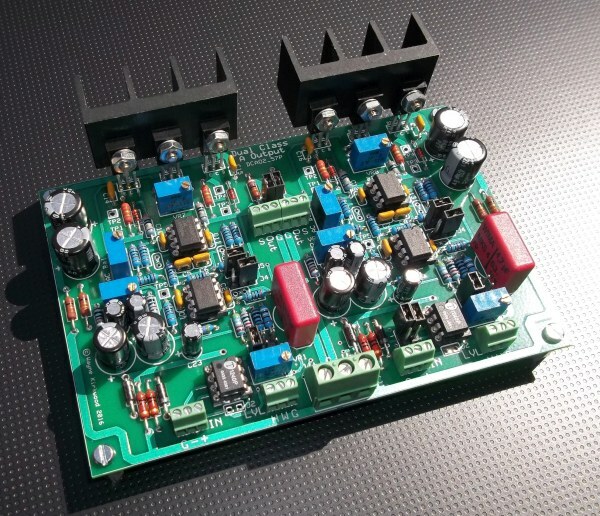 The DCAO2 improves on the original Dual Class-A to provide voltage gain and the option of overall global feedback for a very low "0 Ohm" output impedance and Class- A/B power extension from 100 mW to >1W. The Dual Class-A II is ideal for both hard-to-drive high impedance and low impedance headphones. With 600Ω loads the maximum power output is 125 mW. At 15Ω loading the maximum output power is 2.8W.